The route of the Lakes geographically coincides with the vinicultural areas of Western Macedonia. The climate is characterised by low temperatures and significant snowfalls during the winter, whereas in the summer, there are frequent strong winds from the north. The wineries at the Wine Route of the Lakes are:Alfa Estate in Amynteon and Vogiatzi Estate in Velvento Kozani. In Siatista Kozani one can visit the winery The Two Friends whereas in the area of Kastoria participating wineries are: Domaine Stergiou . Lakes Vegoritida and Petres are the landmarks of the region. At the banks of Vegoritida lake, visitors can have a meal at the local taverns of Agios Panteleimonas, overlooking the lake or go for a walk along the lake’s bank. There is plenty of accommodation options. The lake of Petres is a protected area under the European programme Natura, due to the presence of predatory birds and other rare bird species. The programme aims at the protection of the rare species of birds and the conservation of the wildlife sanctuary. The Municipality of Amynteon has planned the construction of observation posts at the region and has issued a special informative leaflet concerning the lake of Petres. The tour of the area can be combined with a visit to Nymfaio, which is situated at a distance of 23 kilometres off Amynteon. Nymfaio is a traditional settlement offering visitors a chance to admire the magnificent view, stroll through the village’s cobbled streets and visit the folklore museum. At a small distance from the village there is the E4 path, taking visitors to a beautiful route along the beech forest of Mount Nymfaio. There are also facilities for horse-back riding and hand-gliding as well as mountain bikes rentals. Finally, visitors should not leave Nymfaio without visiting the Information Centre and the Brown Bear Sanctuary of Arktouros, a non-governmental organisation founded in 1992, actively working for the conservation of large carnivores in Greece and the Balkans. At Nymfaio there are traditional hotels providing high quality hospitality. The visit to the Wine Route of the Lakes continues to the picturesque town of Velvedo, which is situated 33 kilometres southeast of Kozani at the foot of Pieria mountain, next to Polifitos lake. The settlement has significant Byzantine and Laterbyzantine monuments and truly breathtaking views of Pieria mountain and the lake. Visitors can also visit the Castle of the neighbouring town Servia, as well as the town of Kozani with an interesting museum, library and market. 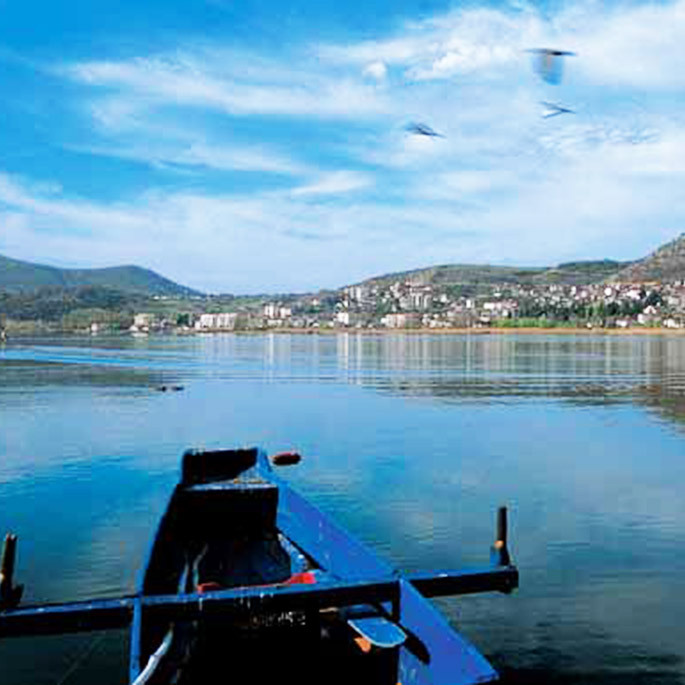 Finally, the journey takes the adventurous traveler to distant Florina and Kastoria on the way south to the end of the route with stops at the towns of Grevena and Siatista.